PostFinance is one of Switzerland's leading financial institutions and, as the market leader in payment transactions, ensures a seamless daily flow of liquidity. Whether in payments, savings, investments, retirement planning or financing – PostFinance meets its customers on their level, speaks their language and offers them straightforward products with attractive conditions. This makes it the ideal partner for everyone who wants to manage their own finances as easily as possible. PostFinance offers large business customers tailored solutions along the entire value chain. 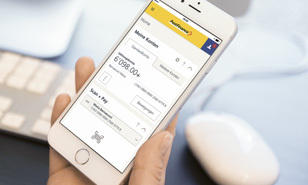 PostFinance subsidiary TWINT has developed a payment app that works with any bank account and any smartphone. Users can pay quickly and easily, for example at Coop, on the Internet and in trendy shops they've discovered thanks to TWINT. Your account is always with you, wherever you are. The PostFinance App offers all the important functions in e-finance, knows the market prices and enables securities trading on the move. Especially handy is the fast service feature, which can be used to quickly and easily transfer money to any contact. More and more checkouts are equipped for contactless payment. You hold your card up to the payment terminal for a moment, the light goes on and the transaction is complete. PostFinance is the first major financial institution in Switzerland to supplement its debit cards with the contactless payment function. Between now and 2018, the Swiss financial center is introducing the international standard ISO 20022 for payment transactions. PostFinance is playing a leading role in this process, and has now successfully launched a parallel service with its customers.